Janesville Community Radio | Beloit Snappers2018 Beloit Snappers MiLB Live Online Broadcasts on 103.5 WADR! WADR is the official broadcast station for your 2018 Beloit Snappers! To listen, tune in to 103.5FM or click Listen Live at the top on the right. Imagine going to the Pohlman Field, and listening to the play-by-play of the game as you are watching it! With WADR, this is a reality! Download our app for iPhone, iPad and Android devices! Don’t forget to stop by and say ‘Hi’ to the crew while you’re there! 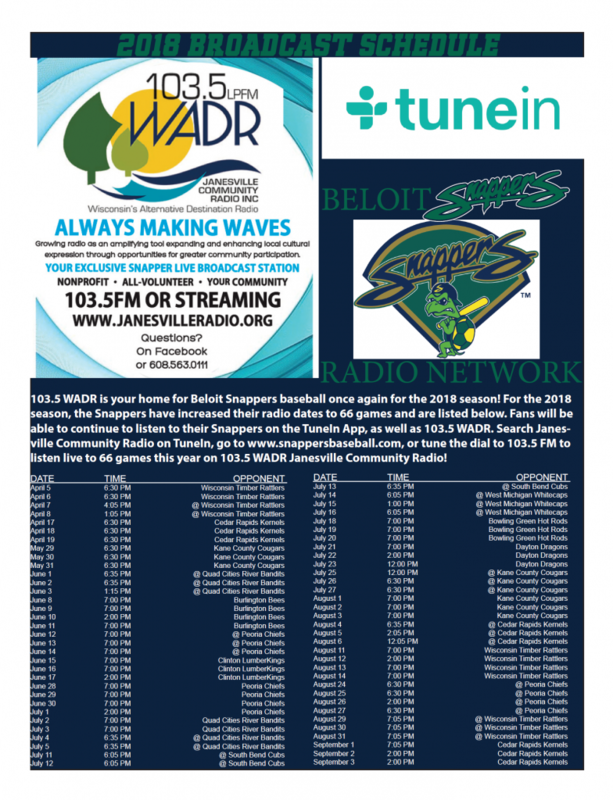 Beloit Snappers baseball on 103.5FM WADR is also made possible by financial contributions from listeners like you. Thank you! Click below for a printable schedule of all 2018 Beloit Snappers games airing on 103.5 FM WADR!